PLN – an essential social structure for us who live in the emerging age of the Culture of Learning(1) – Part 1 | shift. Two years ago, Georg Rückriem reviewed my re:publica13 Talk. He noted about my PLN graphic that it looked precisely like the “toolificative” understanding (i.e. reducing media to tools) I wanted to critisize. He was right. But a sufficiently complex understanding of the concept of a Personal Learning Network is still difficult to describe in words and even more difficult to visualize. My visualization was only meant to depict that learning is always an activity comprising the interplay of interiorizing, exteriorizing, and dialog, and how well this interaction can be triggered and supported by social media means. 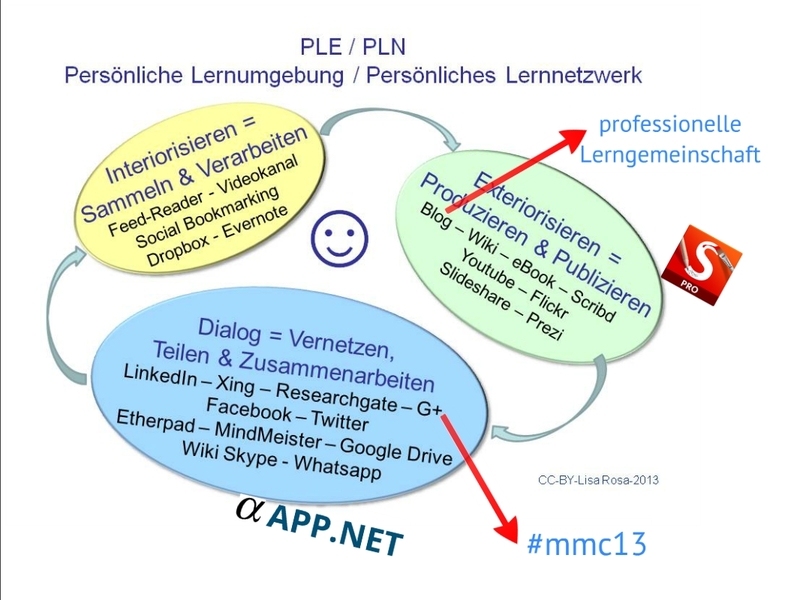 But since the picture has already made its way into the German Wikipedia, I won’t wait any longer to make a fresh attempt of describing a more complex understanding of PLN. In the last few years I have become increasingly convinced that the PLN is becoming the most useful and most needed social structure for everyone as their personal means for a successful life – both at present but of course even more in the future. This could indeed be considered a bold thesis, and hence I will try to unfold the thesis’s main underlying thoughts below. Unfortunately in my German environments, the idea and the conscious usage of a PLN are not exactly widespread. Mostly, not even the term PLN is known to those who train our teachers or work for their professional development. And not even in the mainstream thinking of the particular community whose members call themselves “Medienpädagogen” (= media educators) it is common to think of the PLN as a core matter which has to be taught to pupils/students/colleagues/employees. If you google in Germany “PLN” or “persönliches Lernnetzwerk”, you get almost nothing, except the first shot in the de.wikipedia I mentioned above, and a google German translation of the outcome of an EU LLL- project named “Autonomous Personal Learning Networks for Language Teachers” which took place in 2010 with the participation of five EU-countries, Germany not among them. The project’s tangible longer- lasting outcome was a tool-centered handbook aiming to help teachers who were already interested in choosing and handling different tools like e.g. Twitter or Diigo. But the problem with all these kinds of “tools teaching to handle tools” is always: If there is already enough real interest on the one hand, there is not much tool-teaching needed and you may skip the program. And if, on the other hand, you put the tools at the center, it is also very unlikely to arouse interest in those who are by now not interested. For the meaning for doing all this learning work and spending a lot of time – particularly teachers are rare of – is far from clear to them. 2. What is the problem and why is it a problem? The wide spread disinterest in or even the rejection of digital technology for learning purposes is only the outwardly visible field in which the cultural battle is fought, and in doing so, the real nature of the problem remains hidden for all the combattants. The real problem is the necessity of overcoming an obsolete perception of what knowledge and learning mean today. For not the technology is the problem, the meaning is the problem – and of course the meaning’s consequences could be scaring. And often I observe that the ignorance or rejection of the ongoing change in the societal meaning of knowledge and learning is the problem for both sides, for the non-technology educators as well as for the edu-techies themselves. It is an overall societal problem of not realizing a reality under general transformation – but particularly for those who are dealing with learning and knowledge professionally as they are teachers and lecturers in the education system or scientists in the science system. Consider this: If I, a 60-year-old-literature-and-other-“humanities”-loving female who has never been interested in any technology, have had few if any problems with the technology when I started computing about 15 years ago on my own, why should anyone else have problems with it today? It can’t be an issue of loving or not loving technology. The problem even for young teachers-in-training is the hunch that they might have to rethink most of their assumptions and certainties about knowledge and learning. Not to mention what the problem for long-serving teachers must look like: It requires the revision and reconstruction of all the professional knowledge and practices they were used to for decades. And this revision comes with probably life changing consequences. One can understand that this is not easy. So everyone must actually have very strong reasons to do so. Most people only undertake a revision of their belief systems if squeezed by strong forces. It is definitely not the right force if an evangelistic guy, twenty years younger and not experienced in teaching, comes along to persuade you to need New Media “for becoming a better teacher”. Hence it becomes very understandable if everyone feel to hold against such an imposition. 1. I found personal sense in exploring the brand new technology: For me the squeezing forces were my own feelings of being heavily unsatisfied with my working outcome and my working circumstances. And: the last resort of running away was barred. 2. I discovered and learned the societal meaning and the techniques simultaneously. 3. It took me lots of hours in many years of practicing, and I found the time to do so. 3. What is a PLN? People but not tools are obviously in the center of this definition. Connecting with people as nodes of a network is at least as important for learning (as the operation mode) and knowledge (as the outcome of learning activities) as connecting with things as resources of knowledge itself. “Knowing people who know” contains much more possibilities as knowing only what you can learn by yourself. And only with people you can get the dialog part of the learning trinity mentioned above. Such a Personal Learning Network is obviously not necessarily bent on digital social media. Therefore, your PLN might also only consist of your family members, some colleagues and your boss, some neighbors, your old English teacher, some old friends, and your football team. But we would never have called this sort of social relationships a net – although it might be seen as one. And even less would we have called it a Learning Net – although this sort of relationship- net is the structure in which informal intentional or unintended learning happens all our life. 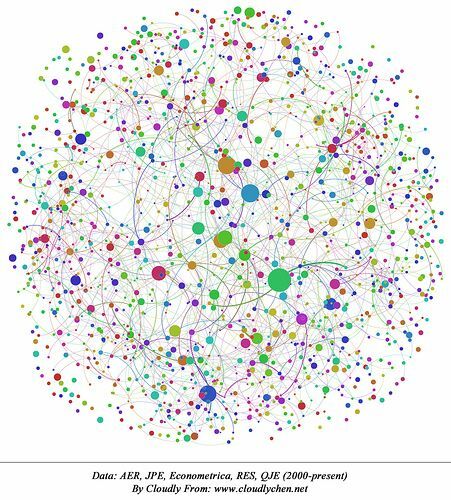 So we have to take this new concept very seriously in its components: The network attribute marks the nature of the structure: It is not made by institutions or other traditional social systems (family, neighborhood, workplace hierarchy …) and hence it follows mainly the rules of networks. There are also social regularities made by members; but their validity is not fixed – it partly depends of the members of your specific PLN. 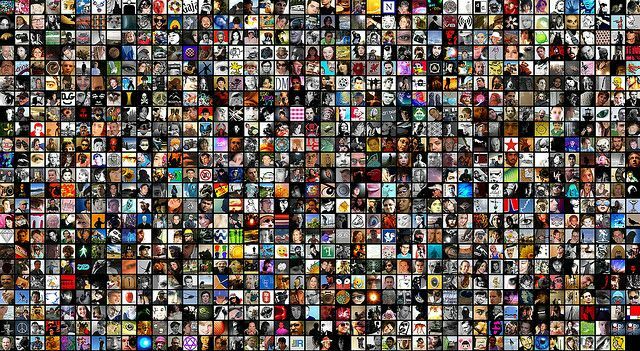 Personal means: You are the creator of your PLN, no one has the same network constellation as the other, and you can change it at every time. At least the part which depends on your own decisions (e.g. choosing the people you want to listen or observe). And thirdly the Learning component: Never before our century learning was a so much mentioned word. And now with the societal praxis of PLN the control-monopoly of learning has partly been wrested away from the education institutions (be they public or private), and has been de-formalized and given into the hands of the learners themselves. No curriculum and no standardized routines and resources are running the PLN owner’s learning. A PLN is the best way to combine the need for autonomy, and the need for feeling socially connected at the same time. A PLN is a novel form of self-directed grouping. It connects you to lots of people and to the connections of these people as well. But within the same structure it connects you to things and resources you are looking for. More precisely: The information, useful for you, is streaming right in front of your nose, 24 hours a day, and you just have to pick it up. But it is not the overwhelming WWW as it is meant in the scaring notion of “information overload”. The stream flowing through your pocket is already filtered by your own well-considered settings reflecting your needs and wishes. And each information morsel in this stream is always associated with a real social connection, you can actively answer to, or not – as you wish. You can join the conversation about the information and make your own contribution, or not. As you wish. At any time with anybody in the world who made him-/herself visible in the internet and has at least one social media account him-/herself. A PLN is a social structure (made of communications) which is shaped by their participating media constellation (personally chosen by the “owner” of the PLN) on one hand, and their participating people (sorted out by the “owner” of the PLN) on the other hand. These factors together are building constantly the limiting framework of your communication (and learning) possibilities. The amount of possibilities is therefore huge but not unlimited. How huge it actually will be, is your own choice. How narrow or expansive you shape your settings for filtering the (nearly) infinity and make it manageable thus, is up to you. And to learn how to build this construction adequately to your wishes and developmental needs, and how doing so better every day, is a fantastic learning experience itself. The structure’s members are not only people but also social systems like companies, organizations, or even parts of institutions. And since it is one of the practices in social media, not only to share thoughts and opinions but also things (data, documents, all sorts of digital resources) these objects become also part of the play. The sharing is at least as important as the conversation. If the structure’s “purpose” in the first place is to collect connections and build itself it can’t do that without sharable content. So there are two first places, as it were, because a collection without meaning is worthless. And the meaning depends on the PLN-owners’ goals for what they want to use this media constellation. Hence there is a lot of disappointment to be observed, when people don’t know for what purposes they seek communication with new people they didn’t know before: “I don’t know what I should say or who I should listen to. It’s a waste of time.” Or if they don’t know how the structure works: “Why doesn’t anyone read, comment, or share my tweets or blogposts? Nobody is showing up.” To make a PLN valuable and enjoyable the owner has therefore on one hand to know how the system works, not only in a technical sense but also in regard to the understanding the social functioning and the respective rules, policies and practices. And on the other hand he/she has to follow strong purposes – which nonetheless may change over time. In the latter case the constellation and the people of his/her PLN will likely undergo a modification too. In short: The PLN is your access to the contemporary culture. And culture means all that is not nature. And since nature today is never really without traces of culture – it means the world. 4. Why do we need a PLN? And the stripping of context was the prerequisite for systematic learning – the kind of learning our school system prefers. And the school system provided the societal preconditions, namely fast literacy for a majority of society’s members. So the consequences of this independence were – as costs and as advantages at the same time – the standardization of knowledge bound to hierarchies and authorities as certified and certifying filters of sanctioned knowledge. This meant information was only available as given knowledge – i.e. loaded with the meaning of the – also given – authorities. Seen from a radical democratic perspective it was sort of contaminated information, as it were. And you needed a lot of books to read through only to sort out what could be useful information, meaningful to you, or in other words: to distinguish information from disinformation or propaganda. Today everyone is free to look up any information on the Internet in seconds. But which particles of information in what combination do you need, what is useful for you, and what is crap? How to make sense of it? How to make the distinction between the conspiracy theory and the actual conspiracy? Because knowledge is not the information itself but a specific combination of certain information chunks which were brought together by meaning, we speak of “distributed knowledge”. It is knowledge in the state of possibility, as it were. To get exactly the information chunks you personally need to make your meaningful knowledge of, you need people to help you filtering the information soup and fishing for the bold pieces that make sense especially for you. The previous authorities are no longer available and if, they are no longer reliable and trustworthy, at least not with the same certainty, generations have (misleadingly) relied on. So who is the one who can tell you what is right or wrong? You have to find your own people you can trust. Trust is not only a question of faked data and copy-and-paste-PhDs. It is also an issue of what theories and assumptions about our society we had learned for generations from the unquestioned authorities and which have observably turned out to be terribly wrong (e.g. the sacred cow of “homo economicus”). So it is particularly important to learn how you yourself can oversee your own knowledge and learning, its purposes, its resources, and its processes. Although this responsibility of a mature individual with judgement based on critical thinking is thought of since the age of enlightenment, both the need and the possibility for every individual to achieve the skills to be able to do so, are utterly increased with the new media which triggered the ongoing transition into a “digital age”, or “learning culture”. Nothing is implied about the precise understanding of these very broad concepts by only mentioning them – which is often criticized, particularly by those who believe that critical thinking comes only after having learned all the “basics” and “facts”, and also by those who scent only the capitalistic abuse, and thirdly by those who think of the internet as the exterminator of critical thinking. Nonetheless is the notion of the 4 Cs important by any means, as a very first step to identify the changing individual and societal needs of people’s abilities. And in the second step we have to define the concepts and detail them carefully. And in a third step we must answer the strategic question of how to make it happen that these skills or competencies spread universally. I will try to do that in a different post. While brooding over it, I highly recommend the reading of Sugata Mitra’s article titled: “Advent of Google means we must rethink our approach to education”. To make it short: With the PLN you are able to manage a lot of these challenges for your intellectual maturity mentioned above. This is because it allows you the access to a wide range of information provided by enough diversity of perspectives – if you handle it wisely. Therefore the questions of “How” are of high importance, and deserve a closer look in the next part. The first part of this PLN post got along completely without mentioning any tool-related issues, as you see. But in part 2, I will be more practical and talk about of the PLN’s building and nurturing issues. I will mention also some perhaps surprising ideas of particular advantages of certain tools. And, last but not least, the second part will be about what consequences the understanding outlined in part 1 could or should logically have for the handling of the PLN – especially for teachers and their professional development related to the student’s needs. Cf. Johannes Werner Erdmann & Georg Rückriem, Lernkultur oder Lernkulturen? Was heißt „(Neue) Lernkultur“? Ein Beitrag aus ‚transformationstheoretischer‘ Sicht, in: Tätigkeitstheorie und (Wissens-)Gesellschaft. Hrsg. von Hartmut Giest und Georg Rückriem. Berlin: Lehmanns 2010, 15-52. Dieser Eintrag wurde veröffentlicht in Kultur, Lehrerbildung, Lernen, Neue Medien, Unterrichtsentwicklung und verschlagwortet mit Bildung, Digital Era, Lernen 2.0, Netzwerken, PLN, Wissensgesellschaft von Lisa Rosa. Permanentlink. Hat dies auf paedagogiker rebloggt.